Is it possible to feed the world sustainably? According to John Reganold and Jonathan Wachter it is. The Washington State University researching duo authored “Organic Agriculture in the 21st Century” which was published in Nature Plants. Through extensive research, they found organic agriculture is playing a key role in innovative farming systems. Illustrated by Reganold and Wachter, this graph shows how organic farming systems can better balance the four areas of sustainability. Rather than single out any sector of farming, they found the best approach to feed an ever-growing population was through a systems approach; a blend of all farming systems. What was interesting though, is that they did find, under extreme drought conditions, organic farms have the potential to produce high yields because of the higher water-holding capacity of organically farmed soils, backing up what we’ve known to be true for years. Want to learn how to weatherproof your soils? Comment below and we’ll be sure to follow up with you! In 2008, Mark Doudlah, of Doudlah Farms in Wisconsin, began transitioning 40 of his 1400+ conventional corn acres to organic. Now, that same field is certified organic. He has 200+ certified organic acres and is in the process of transitioning the remaining conventional acres to organic. What spurred him to make such a drastic change? Mark explains he owes it all to his dad in the video below. Please note, if you’re reading this from your inbox, click on the photo and you will be directed to the video. Learn more at the Doudlah Farms/Dramm Corporation/AgriEnergy Resources Organic Field Day 10am-3pm Tuesday, August 11 at Cooksville Community Center, 11204 N. Church Street, Evansville, Wisconsin. Due to limited space, please RSVP by August 3 by calling AgriEnergy Resources 815-872-1190. For a full itinerary, click here. Would Organic Work for Me? Currently, organic corn is selling for about $12.50 a bushel, more than triple the cash price for regular corn. The U.S. Department of Agriculture reports that organic sales have more than tripled between 2002 and 2010, and continue to climb. According to an analysis of U.S. trade data released April 15 by the Organic Trade Association and Pennsylvania State University, imports such as corn from Romania and soybeans from India are booming. 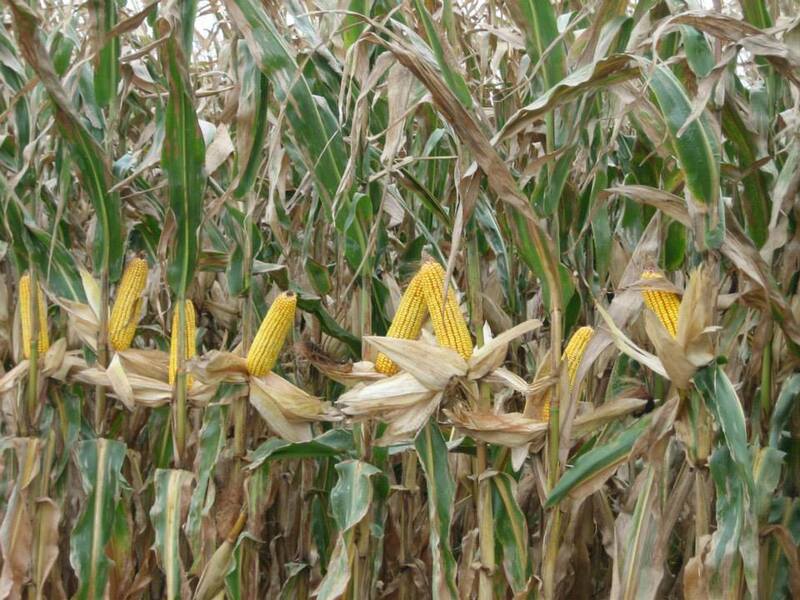 As a result, imports to the U.S. of Romanian corn rose to $11.6 million in 2014 from $545,000 the year before. Soybean imports from India more than doubled to $73.8 million. Could this be why there continues to be more and more interest in transitioning to organic acres? To keep business within the United States? Some of our customer’s certified organic corn. The current market trends point towards a niche market where demand far surpasses supply. Meaning the future is very bright for organic growers and those looking to transition, but there are a few things one should consider prior to taking the leap. Organic is a labeling term for food or other agricultural products that have been produced according to the USDA organic regulations. These standards require the use of cultural, biological, and mechanical practices which support the cycling of on-farm resources, promote ecological balance, and conserve biodiversity. The USDA recognizes four categories in organic production – crops, livestock, processed/multi-ingredient products, and wild crops. We focus mostly on crops – corn, soybeans, forages, edible beans, produce, etc. Operations with more than $5,000 in annual organic sales must be certified. The USDA National Organic Program publishes the USDA organic regulations, with substantial input from the public and the National Organic Standards Board. These regulations must all be met prior to receiving the USDA organic seal that indicates a product is certified organic. If a product is not certified organic by a USDA-accredited certifying agent (ACA), a USDA organic seal can not be used. Producers looking to become certified organic must change the way they approach farming. During the 3-year ‘transition period’, they must keep detailed records of all substances applied to the land, provide a detailed description of their farm including the organic products grown, and a written Organic System Plan describing the practices and substances they intend to use to a USDA-accredited certifying agent. An inspector will then conduct an on-site inspection of the applicant’s operation to be sure the applicant complies with USDA organic regulations. Organic farmers typically rely on practices such as crop rotation, green manure, cover crops, composting, intercropping, biological control, sanitation, and tillage to control weeds and pests. They must show that they protect natural resources, conserve biodiversity, and use only approved substances for fertility inputs, pest management, and processing aids. Synthetic substances are prohibited unless specifically allowed, and non-synthetic (natural) substances are allowed unless specifically prohibited. The use of genetic engineering is prohibited under the USDA organic regulations. Their philosophy is to feed the soil and it will in turn feed the plants which then feed us. With the current agricultural trends, we’ve been seeing a lot of interest in organics, especially among those handing the reigns to the next generation. 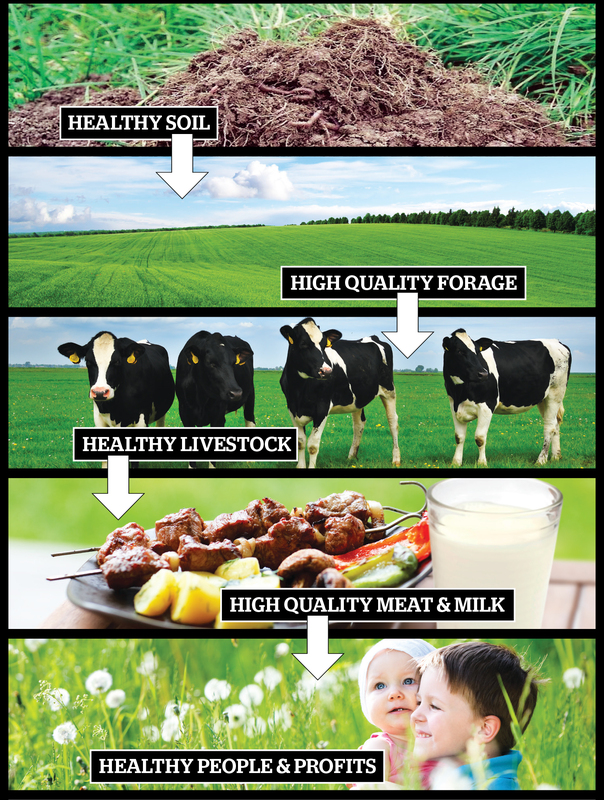 Agriculture is a forever evolving industry, and for some people organics is the next step. Don’t let the 3-year transition period scare you. There are many great organizations out there ready to help you through the process such as the USDA National Organic Program. And us for questions regarding fertility programs. We want to help YOU, yes YOU, grow your operation for years to come. For more information or to view our inventory of products for organic farming, click here. 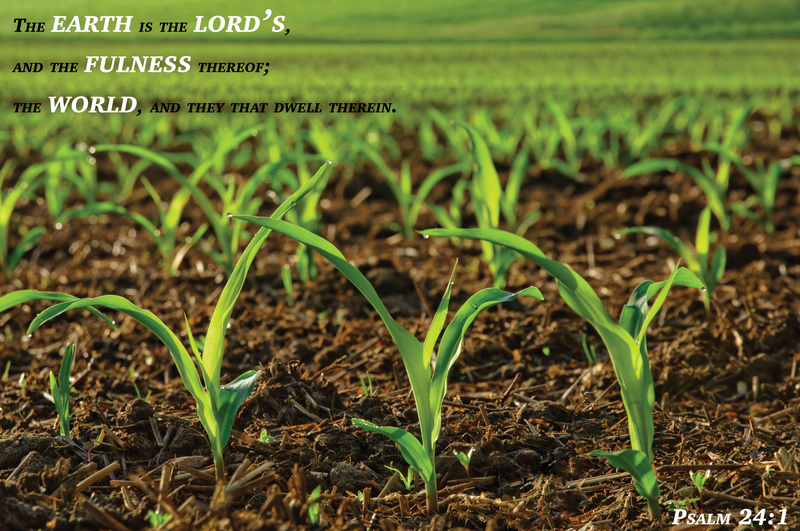 Our founder used to have a plaque with the verse Psalm 24:1 – The earth is the Lord’s, and the fulness thereof; the world, and they that dwell therein. – hanging in his office. So in memory of him and in honor of Earth Day, we’d like to share our own version. Looking to hand over the reigns to the next generation, but needing to change things up a bit? Looking for more income per acre? Do you want to hear about chemical-free farming? Then you won’t want to miss the Organic Grain Transition Seminar we will be co-hosting with the Land Connection on March 10 in Champaign. We know that change can be scary and making the transition to organic acres can be a tough process, but we’re here to help. Some of Illinois’s largest organic grain farmers will be sharing their journey into organic cropland along with the pros and cons they’ve experienced in transitioning. Whether it was dealing with pest problems in the field or storing organic harvests apart from conventionally grown grains, these experts will cover a variety of topics including soil fertility, cover crops, crop rotation, marketing options, organic transition, and record keeping. In addition to a little bit from us about organic inputs and fertilizers as well as the Land Connection, Jack Erisman, Harold Wilken, and Gary McDonald will be speaking. Erisman, of Goldmine Farm in Pana, has been farming 2000+ organic acres for over 25 years; Wilken, of Janie’s Farm in Danforth, has been farming 1100 organic acres for 12 years; and McDonald is an organic conversion consultant. Our goal is that by Tuesday evening, you will not only know how to select ideal alternative crops, but plan for soil fertility and pest management without synthetic inputs, getting the best price for your premium product. The seminar will be held from 8:00 a.m. – 4:00 p.m. Tuesday, March 10 at the Champaign County Farm Bureau, 801 N. Country Fair, Champaign. The cost is $125 which includes lunch. If this is something that interests you, call the Land Connection at (217) 840-2128 to reserve your spot. Believe it or not, but vertical gardens are becoming more and more popular in large cities. There is a growing trend to revitalize vacant property in urban areas and convert it to green infrastructure or urban agricultural areas. Urban agriculture plays a key role in two global challenges: urbanization and food security. It can provide important contributions to sustainable, resilient urban development and to the creation and maintenance of multifunctional urban landscapes. It is for these reasons the International Year of Soils have dedicated the month of February to showing how soils support urban life. Urban soils are often intensely modified by human activity. Did you know by 2050, the world’s population is expected to surpass 9 billion? The benefits of urban farming are numerous. Locally grown food reduces the environmental impact in terms of fuel usage, saves on food costs, and strengthens community spirit. 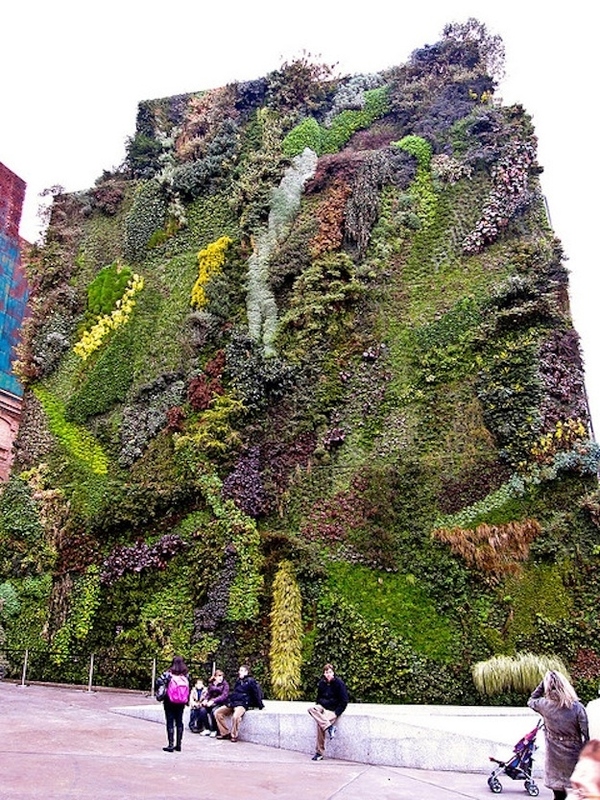 In fact, the second vertical garden shown, designed by Patrick Blanc on the exterior wall of a former power station, features 15,000 plants and 250 different species. 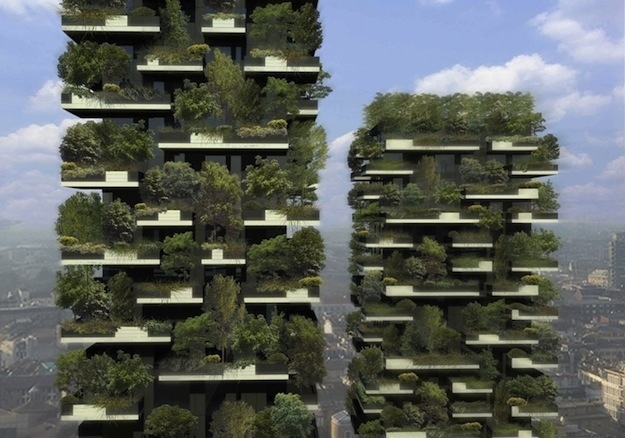 The first vertical garden shown, created by Stefano Boeri on a pair of apartment skyscrapers in Milan, features the first urban vertical forest to sustain the equivalent of 2.5 acres of forest extending towards the sky. Even though these particular gardens are quite immaculate, it doesn’t have to be that fancy. 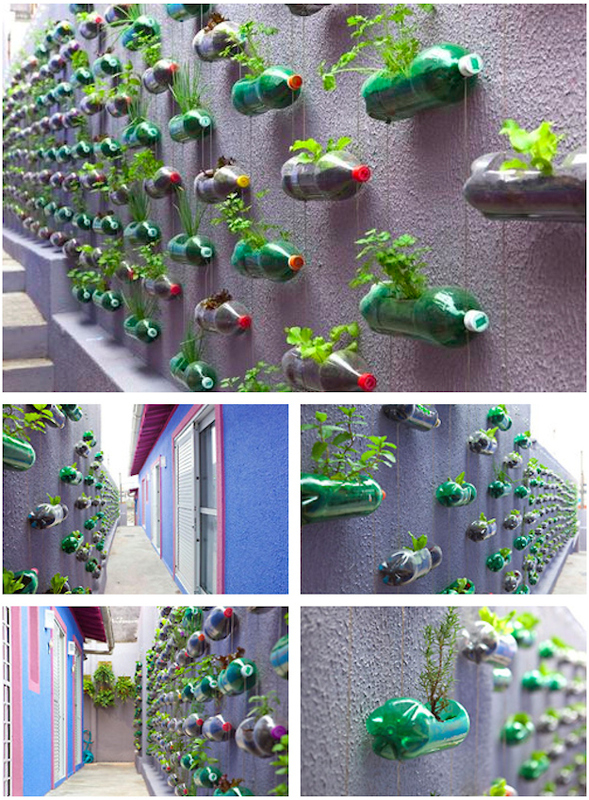 Something as simple as filling recycled bottles with soils and herbs can provide an efficient herb garden. What are your thoughts on vertical gardens? How have you seen soil support urban life? Join us this month as we discuss soils in urban life! Every day for us is about the soil. If we can leave the soil in better condition than the day before, we are thrilled. This is why we’re so excited that the General Assembly of the United Nations has designated 2015 as the International Year of Soils. The international soil community has long complained about the insufficient attention given to soils by policymakers and the public at large, despite current alarming threats to this essential natural resource. Together, with the USDA’s Natural Resources Conservation Service (NRCS), the United Nations Food and Agriculture Organization (FAO), the Soil Science Society of America (SSSA), and the Global Soil Partnership (GSP), among others, we will highlight the importance of healthy soil, healthy plants, healthy animals, and healthy people. We believe everything begins and ends in the soil. We are losing a plant or animal species to extinction every 60 minutes. We may lose, in the next fourteen years, twenty percent of all remaining species of plants and animals, according to the President’s Council on Environmental Quality. The activities (such as over-cultivation) of man are somewhat responsible for the ecosystem changes causing this devastation. Did you know over-cultivation was one of the leading factors of one of the worst environmental disasters in U.S. history, the Dust Bowl of the 1930s? This is what we live for…We’re so excited for International Year of Soils!! The end result of over-cultivation, combined with drought and record-breaking temperatures, led to millions of acres of soil blowing away. The farmers felt that hit hard those years, but we believe bringing the soil back to its natural state could help prevent future environmental disasters such as this. We’d be honored if you’d join us this year as we dig deeper into the soils that sustain us all. Each month we will be exploring various soil types in different countries and just how important healthy soil is, not only to us as human beings, but to nature as well. If this is something that interests you, be sure to check out soils.org/IYS for more information or to find monthly outreach activities. We all have heard about cover crops, but how many growers are actually utilizing them in their farming system? Did you know cover crops can reduce soil erosion and compaction, increase soil porosity and aeration as well as earthworm populations, improve soil health and biology, sequester nutrients, and build organic matter? One of our customers sent us this photo of an oat, radish, and wheat mix cover crop that was flown on standing corn (by helicopter) earlier this fall. The benefits are endless and could be yet another key to profitability in 2015 and beyond. Farmers John Dassow, Jerry Glaser, and Mark Doudlah have seen first hand how using cover crops can lead to healthier soils and profits, especially when used with biologicals. The three farm on a variety of different soils ranging from Illinois to Nebraska to Wisconsin. They all bring with them a long-term dedication to the soil. John Dassow raises corn, soybeans, and wheat, using mostly no-till planting with his father near Chatsworth, Illinois. Jerry Glaser and his wife Cindy farm 750 irrigated organic crop acres and pasture to support 400 cow/calf pairs and organic grass-finished beef near the foot of the Nebraska Sandhills. 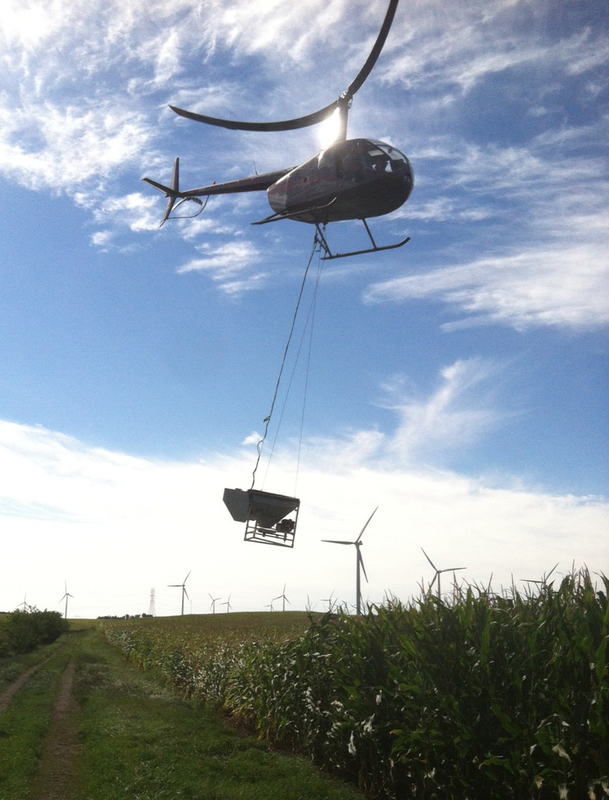 They manage a rotation program incorporating popcorn, corn, beans, small grains, forages, and alfalfa grass mixes. Mark Doudlah farms over 1400 acres of corn and soybeans near Madison, Wisconsin. The three will be sharing their cover crop journey from beginners to believers during our seminar “How to Thrive in Today’s Ag Economy – 10 Practical, Profitable Solutions” from 8:30 a.m. – 5:00 p.m. Thursday, January 29 at the Chateau Hotel and Conference Center in Bloomington, Illinois. For more information, click here or call (815) 872-1190 to reserve a spot by January 21. Happy New Year from all of us here at AgriEnergy Resources! We can’t believe another year has come and gone, but boy, do we have some exciting things planned for 2015. As previously mentioned in a past post, our winter seminar, “How to Thrive in Today’s Ag Economy – 10 Practical, Profitable Solutions,” is quickly approaching on Thursday, January 29 at the Chateau Hotel & Conference Center in Bloomington, Illinois. We hope to offer practical solutions you can sink your teeth into and ideas you can use right away. Ideas you can take to your banker, landlord, spouse. Solutions like cover crops, under-cover crops (biologicals), alternative crops, non-GMO crops, and organic crops. This all-day event will begin promptly at 8:30 a.m. concluding at 4:30 p.m. with a Q/A time. Lunch will be provided for those with advanced registration. 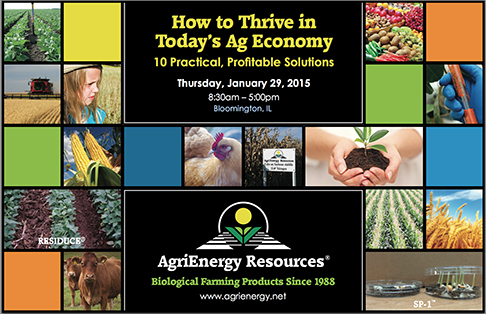 Please RSVP by calling 815-872-1190 or emailing info@agrienergy.net by January 21, 2015. Hope to see you all there! You’re invited! Mark your calendars for this “can’t miss” seminar presented by AgriEnergy Resources from 8:30 a.m.- 5 p.m. Thursday, January 29, 2015 at the Chateau Hotel & Conference Center in Bloomington, Illinois. We have an exciting roster of speakers to discuss common sense ideas for making a profit next year. They will offer practical solutions you can sink your teeth into and ideas you can use right away. Ideas you can take to your banker, landlord, spouse. Solutions like cover crops, under-cover crops (biologicals), alternative crops, non-GMO crops, and organic crops. We look forward to seeing you there! More details to follow.